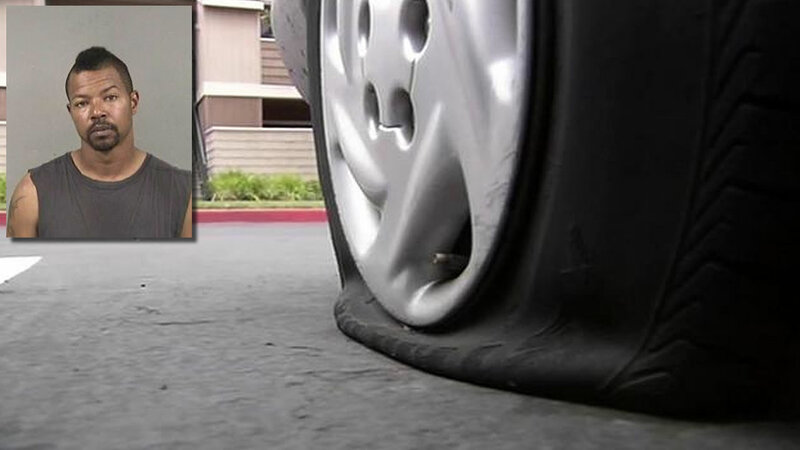 SAN LEANDRO, Calif. (KGO) -- San Leandro police arrested a suspect Monday accused of slashing tires on dozens of cars over the weekend. Detectives located the man near B and 3rd streets at 1:30 p.m. in Hayward. Police identified the suspect as 35-year-old Brandon Thompson of Hayward and said he has family living in the apartment complex where the crime occurred. "Unfortunately, many residents in this complex were victimized for a reason that we don't have the answer for yet. Our detectives will interview the suspect and try to answer that question," San Leandro Police Department Lt. Robert McManus said. Residents living at the Parkside Commons apartment complex on 143rd Avenue were stunned to find so many vehicles were targeted. At least 16 vehicles had one or more tires deflated. Gerald Hurd found out he had been victimized when he tried to drive to work Sunday morning. "A lot of frustrated tenants around here right now, so hopefully this is something we'll never see again around here," he said. Hurd said a San Leandro police officer investigating the crime gave him a ride to his job. Residents held a meeting with property managers Monday morning to talk about security. Police said the suspect is expected to be in court on Wednesday. The San Leandro police credit the witnesses and others who reside in the complex for helping them solve this crime. Police are asking that anyone who has information about this vandalism, or was victimized during this crime, to please contact them at (510) 577-2740. Information may also be submitted anonymously by phone at (510) 577-3278 or via text message by texting "TipSLPolice" to 888777.